New Horizons 2018 is a joint training exercise which provides training to U.S. military members in engineering, medical, and support services, as well as providing support to the Panamanian people. 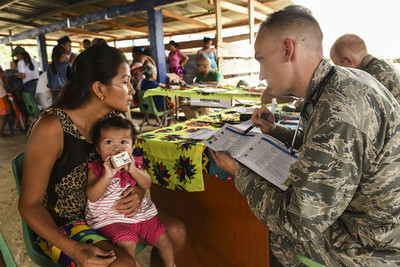 Barksdale’s team of four dental personnel and one logistics technician joined 10 Panamanian dentists and five U.S. Army dental personnel to deliver needed services to communities in Panama. The dental team leader is Air Force Lt. Col Joanna McPherson, 2nd Dental Squadron clinical flight commander, who said she’s excited to participate in New Horizons 2018 and grateful for the training it provides. “We have been able to train on equipment usage and utilization of our deployment dental units,” McPherson said. “We don’t get a lot of hands-on time with those units, but here we are able to learn about trouble shooting and maintenance for them. “We also get to train on mission planning, logistics and preparations for operations of a large magnitude,” she added. During the exercise, the medical team has participated in three separate medical readiness training exercises, each in a different location. The dental team’s goal is to provide care to as many people as possible. McPherson has participated in civilian humanitarian missions through dental groups, nonprofit organizations and church groups in Africa, Mexico and Jamaica. She has never participated in a military-led humanitarian exercise and is impressed with the number of patients the team has been able to treat. Due to the dental equipment the team was able to bring, the level of care they are able to provide will go a long way in reducing oral diseases and conditions, she said. The dentists were able to provide teeth cleanings that only credentialed providers are able to, cleaning far below the gum line. Cleanings that deep are able to relive pain and prevent periodontal disease, which causes pain, abscesses and bone loss, McPherson added. For the medical logistics technician, the exercise has provided a unique experience. The New Horizons team brought enough supplies to care for more than 5,000 patients, said McPherson, who noted she’s proud of her comrades. The Barksdale team has also been working closely with Panamanian dentists. McPherson has also enjoyed her interactions with the local dentists and the experience it provides. McPherson said her best experience is being able to help those in need.